Every government employee is morally suspect, this is true. Funded by violent expropriation (taxation), government workers add no net gain to society as they simply confiscate resources from one group to give to another. In fact they provide a net lose as their prima facie existence is dependent on still more tax dollars. State enforcers, like police officers however, have reserved for them a special place in hell. Not only do they rely on coercion to function and pay for their abuses, it is the primary goal of such overseers to eat out the substance of their already heavily taxed countrymen under the auspices of protecting them. In the modern American context, the domestic enforcement apparatus (police) originated from the enforcement of the institution of slavery. The institution of slavery and the control of minorities were two of the more formidable historic features of American society shaping early policing. Slave patrols and Night Watches, which later became modern police departments, were both designed to control the behaviors of minorities…. Slave patrols helped to maintain the economic order and to assist the wealthy landowners in recovering and punishing slaves. Now, don’t get me wrong, I’m definitely no Social Justice Warrior. 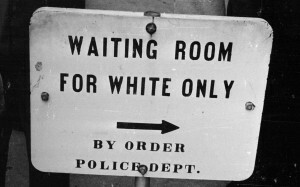 Something must be said however, about the historical creation and enforcement of law and regulation within the context of the institutionalized American racism of the past. It doesn’t take much research to find the out the truth that many laws and regulations were created in the United States for the expressly admitted purpose of oppressing minorities. A federal law followed which made it illegal “for anyone of Chinese origin” to traffic in opium. The phrase became an instant meme and numerous anti-cocaine laws followed around the country. According to the Drug Policy Alliance, African Americans constitute 13 percent of all users of illegal drugs in the country but make up 35 percent of those arrested for drug possession, 55 percent of those convicted, and 74 percent of those sent to prison. With less than 5 percent of the world’s population but nearly 25 percent of its incarcerated population, the United States imprisons more people than any other nation in the world – largely due to the war on drugs, the Drug Policy Alliance points out. Marriage licensure is another example of race motivated legislation, and didn’t emerge until the mid-19th century after newly freed slaves were marrying white women. By the 1920s, 38 states would prohibit whites from marrying blacks, “mulattos,” Japanese, Chinese, Indians, “Mongolians,” “Malays” or Filipinos. It may be a shock for many well-intentioned people who support government regulations like wage mandates as a means of helping minorities, to learn that minimum wages were devised to oppress minority populations as well. The first minimum wages in the U.S. were enacted by states seeing a large influx of newly freed slaves that were able to undercut white labor in terms of employment costs. Today white teen unemployment is about 20 percent, while that for blacks is about 40 percent and more than 50 percent in some cities. In 1948, the unemployment rate of black 16-year-old and 17-year-old males was 9.4 percent, while that of whites was 10.2 percent. Up until the late 1950s, both black teens and black adults were more active in the labor market than their white counterparts. In fact, in 1910, 71 percent of black males older than 9 were employed, compared with 51 percent for whites. As early as 1890, the duration of unemployment among blacks was shorter than it was among whites, whereas today unemployment is both higher and longer-lasting among blacks than among whites. It would be sheer lunacy to attempt to explain these more favorable employment statistics by suggesting that during earlier periods, blacks faced less racial discrimination. What best explains the loss of teenage employment opportunities are increases in minimum wage laws. I point out the above not as a collectivist indictment of the coercive political mechanism on any racial grounds. To the contrary, I seek only to lay some basic ground work in establishing the reality that the situation we now face is not a matter of a Police State against blacks. Its a matter of state against all of us. African-Americans are disproportionately killed and targeted by police relative to population, statistics show, but any encounter with a police officer or state agent is dangerous for anyone. The average American pays around 56 percent of their adjusted income in all state, local, and federal taxes – not to mention the hidden tax of inflation courtesy of Federal Reserve meddling, which has devalued our currency by over 95 percent over the last century. If that wasn’t enough, like vultures, highway men of all stripes are sent out by the state to embezzle and extort even more from us for any one of a million ridiculous laws or regulations. There are so many laws on the books that most Americans commit three or more felonies every day without even knowing it just going about their daily business. Obviously, if caught by any number of men in costumes calling themselves ‘officials’, they will put a gun to your head, handcuff, kidnap you, throw your into a cage, and if you resist, assault or even kill you. And it doesn’t matter what you did. Run a red light, drive five miles over the speed limit, or engage in any numbers of other victimless “crimes” politicians say you owe them money for, and it could be the end of your life. – Especially if you do not like being mugged by armed robbers and stand up against your assailants. While we are being endlessly pursued and extorted by the political class, the real criminals – in many cases the very costumed men themselves, commit crimes daily against their fellow countrymen as they provide protection to the very people at odds most with law and the Constitution they swear to uphold – the political elite. George Bush and Barack Obama can melt the faces off of children with personally sanctioned drone strikes, and criminal banksters can steal billions, but if you fail to signal when turning, you will be hunted down like a dog, embarrassed in your community, pulled over, treated like a criminal, have your property ransacked, and written a ticket for in some cases upwards of a weeks pay. And that’s only the beginning. The next frontier in revenue collection has arrived. Computers attached to speeding and red-light cameras now read our license plates and automatically send tickets to our homes. This is already common practice in many states across the nation like Maryland and Ohio – though citizens are putting up a fight. Eventually, the endless police brutality, corruption, and out-right theft will no longer be tolerated. Rather than attempting to help the people they claim to serve by refusing to extort them for meaningless and victimless crimes like drug possession and moving violations, police agencies have responded with mass-ticketing blitzkriegs. One of note was revealed last year when a local news investigation found that Atlanta area police and parking enforcement wing Park Atlanta were issuing almost double the number of tickets normally written in prior years. Park Atlanta wrote 141,000 tickets in 2010. In 2012 they wrote 221,000, the investigation found, with the city receiving millions of dollars in extra revenue. I’m not sure how issuing parking tickets keeps people safe but even if you are going to make the case for traffic laws, at least look at some evidence you might not be familiar with. As far as safety is concerned, studies have shown that things like speed limits have no positive effect. In fact, they have a negative effect and can actually make roads more dangerous. Especially when set too low. Also, studies and observations made in towns that have lost electric power or had all their street signs are covered up, found that instead of chaos ensuing, traffic actually tends to moves faster, with more efficiency as the road becomes safer, and people naturally negotiate themselves around each other. Staddon says a lesson should be taken away from the UK’s approach to traffic control. There are very few mandatory stops. The stop “signs” are just dashes in the road, and they don’t really mean stop, just yield. Instead of four-way stop signs, “roundabouts” are utilized whose only rule is to yield to traffic coming from the right. Also, in the UK, speed limits are determined by road type, and are not set as arbitrarily as they are in the U.S. The result, Staddon says, was a 36 percent lower traffic fatality rate per mile from 2003 to 2006 than the U.S. When looking at traffic-related death statistics around the would, it would first appear countries with fewer traffic laws have higher fatality rates. Going by sheer numbers alone, this may be correct, but large countries like China, India and Brazil are the most populated in the world. Lack of infrastructure and medical care predictably can account for some of this disparity also, but when examining the data per 100,000 vehicles on the road, a different picture emerges. Even when looking at experiments of repealing traffic laws and regulations in western cities, the truth is made clear. According to a 2006 Der Speigel article, the number of traffic accidents in Drachten, a city in the Netherlands, “declined dramatically” after traffic rules were repealed by traffic guru Hans Monderman, who replicated similar successes in other cities in Germany, Denmark, and Great Britain. Monderman makes a good point here. Victimless crime laws can prevent nothing and generally have the opposite of their desired affect. People aren’t just idiots that can’t get by without the benevolence of government stop signs. I mean, think about it. If traffic laws didn’t exist, would you just dive aimlessly without paying any attention? Of-coarse not, you would pay more attention – as a beautiful and spontaneous order emerges on the roads free from the coercive and dead hand of the state. Aspects of the Monderman Model have been also been tested in the U.S. in places like West Palm Beach, where the reconfiguration of traffic layout and laws resulted in a doubling of property values as increased pedestrian traffic attracted new shops and apartment buildings. 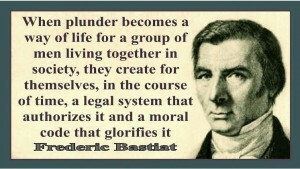 The great French philosopher and economist Frederic Bastiat defined legal plunder as “the act of appropriating, under the laws, the property of others.” According to statistics compiled by Statistic Brain Research Institute, 112,000 people receive a speeding ticket every day in America at the average cost of $152 a piece. That means out of a possible 196,000,000 drivers on the road, 41,000,000 are ticketed for speeding annually – over 20 percent. That puts the total amount of money paid in speeding tickets per year by American citizens at around $6,232,000,000 making the average annual speeding ticket revenue per U.S. police officer $300,000, with only 5 percent of ticketed drivers contesting the fines in court. 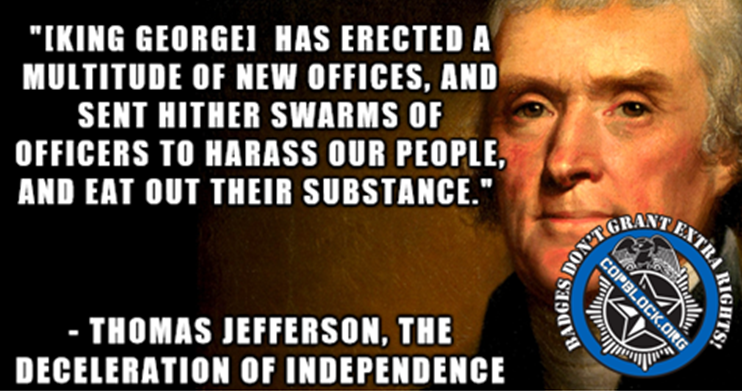 We face the exact same situation today. The issue of our time is not one of police brutality against minorities, it is an issue of state brutality, theft, and coercion against all of us – and there is a better way to live. To the passing officer I would offer this: Quit eating out the substance of your very own countrymen. Exercise your discretion and refuse to enforce laws for victimless crimes that seek only to impoverish your fellow man and woman. We all know this is not an applicable strategy as officers who don’t generate revenue are seen as “soft on crime” and rarely keep their jobs for any significant length of time, but I think a quote by the late economist, Dr. Milton Friedman embodies the reality of the state enforcement apparatus.